Seven hundred years ago today, a dying knight uttered a curse as the flames of the pyre he was tied to lapped at his feet. Those words continue to haunt us even now. That knight was Jacques de Molay. He was the Grand Master of the Order of the Poor Knights of the Temple of Solomon, generally known as the Knights Templar. A fraction more than two centuries after the Knights of Order of the Temple of Solomon had been founded amid the rubble of Jerusalem to defend the Holy Land, it would now be ended by flame in the heart of Paris. Betrayed by a king he trusted and a pope he was sworn to obey, in his final hours DeMolay fought fervently against the false charges which had destroyed his international network of Christian warriors. It was the final act in a power play that makes the schemes of Game of Thrones seem like mere schoolyard squabbles. De Molay, oddly, lives on. A contemporary source tells of a group of monks secretly swimming to his funeral pyre on an island in Paris’ River Seine to gather up the old man’s bones as holy relics. His name has echoed through history ever since. The idea of the Order of the Temple itself refused to die. Though formally disbanded and its assets nominally handed over to their arch rivals — the Knights Hospitaller — there were few untouched enclaves of Templars who changed their name to escape retribution. But the black-and-white banner of the Poor Knights would rise time and again throughout history by the oppressed and those seeking association with secrets, occult and mystery. And, as the likes of The DaVinci Code, Game of Thrones and Ivanhoe attest, it’s an idea that resonates even now. But by 1314 the scandal had died down. The arrest and accusations against the Templars was old news. The fate of its members — and its wealth — seemed little more than a formality. A papal commission of inquiry was appointed to pass final judgment on four of the Templar’s most senior commanders. Two of the inquisitors were considered “royal” men — being close associates of King Philip “the Fair”. The third cardinal was one of Pope Clement’s closest friends. Naturally, the outcome was a foregone conclusion. It was to be a public show trial, carefully scripted and conducted under the watchful eye of King Philip’s city guard and most loyal followers and performed on scaffolding erected in front of the famous Notre Dame cathedral. But something inside de Molay had changed. The seven years of torture and imprisonment had not weakened his spirit. It had reinforced it. In fact, the Grand Master had been held in solitary confinement the dungeon of his own Paris fortress for the previous four years. Now in his 70s, de Molay’s body must have been wracked by injury, malnutrition and lack of sunlight. Stepping out into the warm light and seeing his brothers-in-arms again after so long must have ignited his spirit in a way it had never been before. He and his colleagues — Geoffroi de Charney, Hughes de Pairaud and Goeffroi de Gonneville — were dressed in their Order’s iconic white robes emblazoned with the blood-red cross and paraded in front of the crowd. It was intended to be their final humiliation. The people of Paris were expecting a show. A performance. A tragedy. They got what they wanted — but not the anticipated script. The day, March 18, 1314, started well. The full list of charges was read out to the crowd: Heresy. Homosexuality. Corruption. 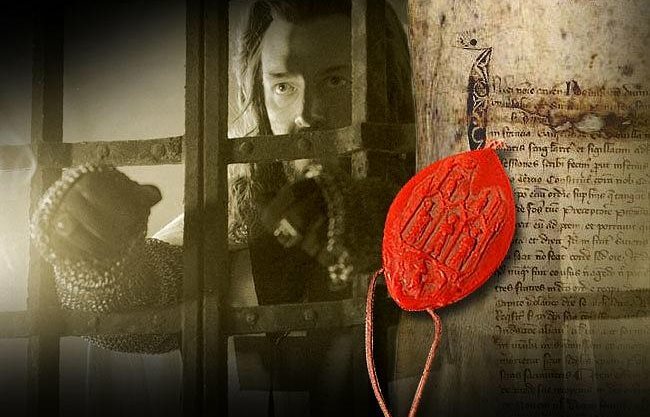 All were reminded that the Templar commanders — including de Molay — had long since confessed to these most awful of crimes. It was time to pass sentence. As the senior cardinal began to read from a decree announcing that the three Templar leaders would face perpetual imprisonment, he was unexpectedly interrupted. By de Molay. The Grand Master who had seemingly confessed so easily to such serious sin seven years earlier — and who had refused to speak out during the show trials which followed — finally found his voice. He demanded to be heard. He asserted his innocence, and that of his colleagues. He accused the king and pope of false accusations and of rigging the trials. The crowd was shocked. They knew what this meant. An unexpected spectacle: A burning at the stake. Such was the fate of all confessed heretics who renounced their crimes. But the performance was not yet over. De Molay’s old colleague under the searing sun of the Holy Land, Geoffroi de Charney, suddenly took up the battle cry. Both launched into a forceful defence of their innocence and a blistering attack on those who sought to steal their land, their power, and their honour. They harangued the esteemed cardinals for their complicity. They emphatically denied the allegations and pointedly revoked every aspect of their prior confessions. De Molay and de Charney knew the consequences. So did the remaining two Templar officials — de Pairaud and de Gonneville. Both cowered into the background, abandoning their superiors to their last stand. The cardinals were stunned. They quickly fled the uproarious scene. The king’s men knew what to do. Such a revocation of guilt meant the Grand Master and the Preceptor of Normandy had voided the protection of the Church and were now under royal jurisdiction. They dragged the two Templars away. King Philip heard of the outburst within minutes. His extravagant new palace was just a few hundred meters up the road. It was too much for the troubled king to tolerate. His family was torn by scandal — the wives of his three sons all having been found guilty of adultery only months earlier. Any other such challenge to his flagging authority and reputation needed to be stamped upon, and quickly. He summoned an immediate session of his royal council. Nominally it was to discuss and pass judgment upon the two relapsed heretics. In reality it was most likely a shouting session. The verdict was arbitrary anyway. King Philip gave the two Templars what they wanted. 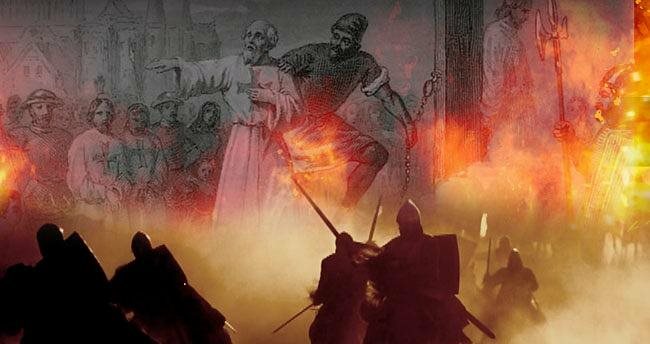 He immediately issued his decree: Jacques de Molay and Geoffroi de Charney were to be burnt at the stake that very evening, at the hour of Vespers. The place of execution was ordered to be a small sandbank at the foot of the island in the middle of medieval Paris which formed the seat of royal and religious power. It sat in full view of the island’s royal gardens and palace, and of the Monastery of St Augustine on the opposite bank of the River Seine. It was the end of an era. All knew this. All wanted to see how this suddenly courageous Grand Master faced his death. Chroniclers from the time tell of how de Molay willingly cast off his clothes and walked up to the pyre dressed only in his undershirt. Some say he asked to be tied to the stake with his hands free so he could pray. All paint a picture of a calm and determined man, content with his fate. It was an age of superstition. While the sparks of the Renaissance were beginning to fly — particularly among the new universities of Paris — there was still a pervasive belief in the power of curses, prayer and prophecy. The chroniclers tell of “how gently” de Molay met his execution. To the silent crowd, this would have only added to the power of his final words. De Charney, seeing the extraordinary manner in which his commander had died, declared he was proud to burn in the colours of his Order, and desired to do so with the same grace as his Grand Master. The righteous piety in which the two knights were immolated was in stark contrast to the stories of cowardice, corruption and heresy the Paris crowd had been sold over so many years. Their deaths invoked so much admiration among the crowd that it inspired centuries of doubt as to their guilt. It also inspired the myths that seemingly will not die. King Philip’s government was bankrupt. He’d squandered his wealth on a series of failed wars and expensive monuments to his ego. He needed cash. He needed income. He lusted for power. The manner in which the hearts and minds of Europe’s pious public were played, how the legal system was manipulated and how the cowed Catholic Church capitulated still triggers fears of grand-scale, high-level conspiracy and corruption. But the Templars themselves — as pious knights, as warrior-monks sworn to fight for their beliefs — reflect our fear for modern religious-inspired terrorism and the righteous claims of those who fight against it. Add to the mix the charges of heresy, magic and conspiracy and you have a rich recipe few authors — and charlatans — can resist. They’ve been linked to the Turin Shroud, the Holy Grail and the ‘hidden bloodline’ of Jesus Christ. From Ivanhoe to Indiana Jones, Hellbound to Assassin’s Creed, Kingdom of Heavento The DaVinci Code — the myth of the Templars all play a part. And the name of the Order has been invoked by secret societies for centuries, seeking to draw upon the mystical might of the knights’ name.